If someone asks what a green community, or a healthy one, means to you, what comes to mind? I’m willing to bet that for most people it is the visible and tangible aspects: a lovely city park, perhaps, or mature street trees, or bicycle lanes on a city street. If you’re a bit more wonky, you might also think of access to healthy food, or to public transportation. If you work on these matters for a living, you might think of more technical matters such as where we get our energy, what happens to our waste, and whether neighborhood streets are designed in a pattern that facilitates walking to accomplish everyday errands. These aspects are important, and in a long environmental career I have worked on most of them. But I’ve also usually worked on them in piecemeal fashion, one at a time. I’ve lobbied for transit funding, for example; I’ve worked on green neighborhood revitalization; I’ve worked on how carbon emissions tend to vary from one regional location to another; and more. Today, however, I want to approach the subject a bit more holistically. Since I left full-time employment in a national, nonprofit environmental group and entered the private sector, I now find myself in the position of being “the environmental guy” in rooms full of people who care about communities but whose primary interests lie elsewhere. This means that I have limited time to make my case, and I need to do it in a way that respects others’ (usually very legitimate) concerns. I need to get it right, and I need to be very clear in my own mind about what I am trying to accomplish. What are the bottom lines, so to speak, of a green and healthy community? What, exactly, am I working for? So, I’ve come up with a list. In particular, I propose a list of ten questions that every community should ask in order to identify ways to become greener and healthier. While we may be working on some of these issues one at a time, I find it helpful to keep all of them in mind, because we don’t want our advocacy for any one aspect of our agenda to unduly compromise one of the others. 1. 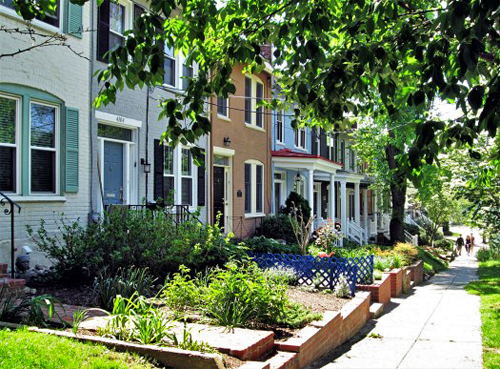 Are neighborhoods fully hospitable to residents with a range of incomes, ages and abilities? This one is not explicitly environmental, but I put it first because in some ways it is the most important. As I have written before, if our solutions don’t work for people, they will never work for the planet. 2. Does the community respect nature, integrating natural areas and systems into regional planning and neighborhood design? First, this involves conserving environmentally significant or fragile land, including but not limited to wetlands and floodplains. (See recent posts by my colleagues Hazel Borys and Ben Brown on community resilience and lessons we should be learning from recurring storm-related flooding.) Second, it involves integrating elements of nature into those more urban places where we do build. Unfortunately, I think this issue has not received as much emphasis in traditional smart growth and urbanist advocacy as I believe it deserves: In our enthusiasm for hardscape urbanism and downtown infill, we too often have ignored our innate need for living nature. To be sure, integrating nature into a highly urban neighborhood requires considerable thought and effort. But in some places we are getting better at it. (I have previously written about green stormwater infrastructure, for example, as a terrific way of beautifying our streets while making urban communities more resilient.) And it is critical if we want our communities to be living ecosystems that people want to live in. 3. Do buildings and infrastructure take advantage of resource-efficient design and management practices? Green buildings are mainstream now and green infrastructure, as noted, is advancing. Indeed, some forward-looking institutions believe it is time to begin installing “net-positive” buildings that produce more sustainable energy and water than they consume, and that generate no net waste. In the meantime, we should at least ask if the structures and supporting systems in our communities – particularly the new ones – are moving in the right direction regarding reducing resource consumption and pollution. 4. Do the community design and social structure encourage healthy living and well-being? This is another biggie, and it can lead to fascinating inquiries, including whether there is clean air and water; walkable access to shops, amenities, and services, including good schools, healthy food, and parks; good health care facilities and services; and plentiful playgrounds and sports facilities. It is also important that these community assets be equitably distributed. 5. Is the overall metropolitan or community development footprint discernible and no larger than necessary? Are there measures that limit the encroachment of new development onto natural and rural land? Leapfrog development in particular should be strongly discouraged with appropriate policy and incentives. 6. 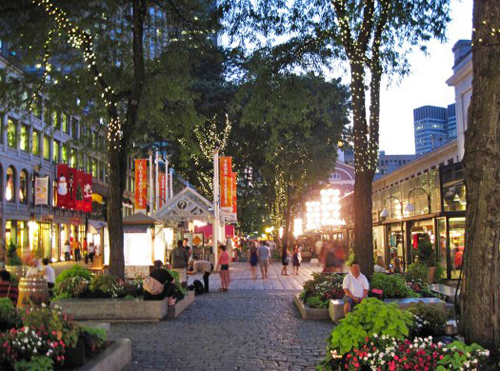 Does the community include public spaces of beauty, character, and utility? Qualities such as “beauty” and “character” may be hard to define, but it is essential that we ask these questions and try our best. 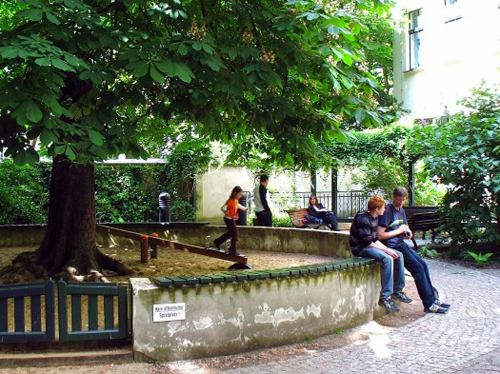 Public spaces in particular give definition to a neighborhood, a town, a city. These include parks, plazas, and monuments, of course, but we must not forget that streets are our most plentiful, visible, and important public spaces. Do they serve pedestrians well? Is their scale pleasing and harmonious? Are they inviting? 7. Are there convenient, safe, affordable and efficient transportation choices? It is critical that residents have multiple ways to get around. In communities of any scale, this must include convenient, pleasant public transit. For all communities, there should be “complete streets” with inviting accommodation for pedestrians, bicyclists, and people with disabilities. Many cities are also now hosting carshare and bikeshare programs: would the community make a suitable candidate? 8. Does new development use land efficiently, with appropriate attention to the context? We made a terrible mistake by allowing so much grossly inefficient, low-density development – both commercial and residential – to be built on our metropolitan fringes in the late 20th century. The result was loss of rural land, longer commutes, increased carbon emissions, and tragically disinvested communities left behind. That mistake must not be repeated. But this question embodies a tension: at least in theory, the highest development density that the market will bear on a particular site will always make the most efficient use of land; but sensitivity to context may sometimes dictate something a bit lower. I think the tension is healthy: it can be a painful process, but within reason I believe it is entirely appropriate for the community (not just the immediate neighborhood, importantly, though their views should be given extra weight) to decide where the balance is struck in each case. 9. Does the community respect and celebrate historic resources and local culture? Our older buildings and neighborhoods remind us where we came from as a community and serve as the built environment’s contribution to connective tissue between generations. They distinguish cities and towns from each other in a world where, increasingly, it seems that every place looks like every other place. And they contribute to sustainability because, when adapted and used well, they obviate the expenditure of energy and resources involved in the demolition of older buildings and construction of newer ones. We do not want our communities to stagnate, and we cannot – and should not – save every older building. But it is important that we identify and conserve the best of our heritage. 10. Does the community encourage collaboration in planning and development? Easy to say, much harder to do. But so important. Decisions stand the best chance of success when there is a feeling of collective ownership over them. These aren’t all the questions we should be asking and, for that matter, they aren’t even all the environmental ones. I suppose they are the ones that I know best and, for me, they constitute a start: if a community can answer most of these questions in the affirmative, chances are that it’s on the right track. If the questions help identify some weaknesses, then those are things to work on as we continue our quest to plan, build, and sustain green and healthy cities and towns. What do you think? A precursor to this article was previously published on HuffPost.